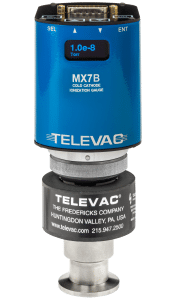 June 19, 2018, Huntingdon Valley, PA – The Fredericks Company, an industry-leading innovator and manufacturer of vacuum and tilt measurement products, today announced the launch of the Televac® MX7B, a new active vacuum gauge that utilizes the well-known Televac® 7B Penning cold cathode gauge to provide contamination-resistant, repeatable, and accurate high vacuum measurement. The MX7B active vacuum gauge is designed for the vacuum furnace and heat treat, thin film coating, and e-beam welder markets, as well as for existing MP7ER cold cathode gauge users and other active vacuum gauge users. It’s easily disassembled for cleaning and gauge replacement to save users time and money and includes a multi-color OLED display, a configurable 0 to 10 V analog output for vacuum measurements, digital RS-485 and USB communications, and a set point relay and open collector for process control. The MX7B can also be connected to an EthernetIP network via the new Televac® MX Active Gauge EthernetIP Gateway, the first and only solution designed to provide EthernetIP communication between active vacuum gauges and Rockwell Automation® Allen-Bradley® PLCs. Designed for harsh environments, the MX7B’s Penning cold cathode gauge is more resistant to contamination than inverted magnetron gauges, meaning it requires less maintenance, minimizing downtime for end users. Like all MX-series active vacuum gauges, all features of the MX7B are accessible through the front panel display or digital communications, simplifying things like calibration, which can now be done remotely through a PC, PLC, or HMI. Televac® provides a complete line of cold cathode gauges, thermocouple and convection gauges, and precision-manufactured hot ionization gauges for a wide range of applications. Dedicated solely to vacuum gauging and calibration services, Televac® provides solutions for industrial heating, national laboratories, cryogenics, and industrial gas applications, among many others, with fast lead times and industry-leading performance. Covering the entire practical vacuum measurement range, Televac® instruments deliver rapid response vacuum measurements with superior longevity and accuracy. For more information or to request a quote, visit www.frederickscompany.com or call us at +1 215-947-2500. For more than 80 years, The Fredericks Company and its Televac brand have been partnering with OEMs and customers worldwide to design and manufacture vacuum measurement devices and precision custom glass components. Fredericks’ team of vacuum engineers and application specialists deliver broad practical knowledge and experience across a wide range of markets and application areas. Learn more at www.frederickscompany.com.